Our new header is a detail from a portrait of Ludwig Van Beethoven by Joseph Karl Stieler (1820). His penetrating eyes, steely scowl, and tempest of a hairdo all contribute to the larger than life, struggling Romantic hero persona that became so legendary and influential. 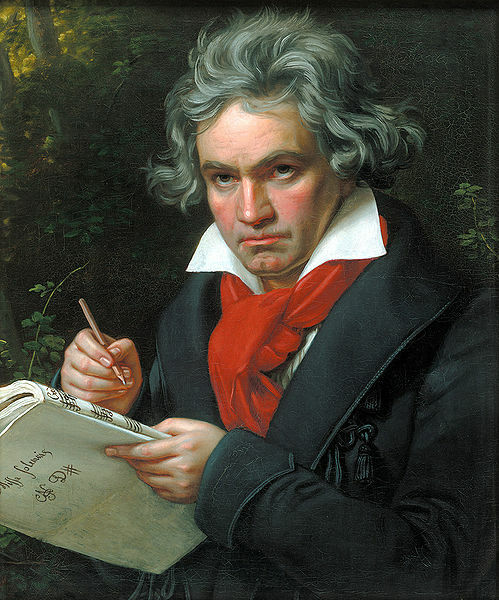 The dark colored suit on dark wilderness background (Beethoven often took long walks in the woods) make his face (framed by the bright white collar), hands, and manuscript more prominent, while the red scarf forms a direct link from head to music, by way of the heart. Solemnis indeed. As we begin to venture into Western music’s most fecund, or at least hallowed, century, we would do well to pause for a moment to remember what came before. To begin with, recall the long history of vocal music’s dominance over the instrumental. Voices, after all, could declaim texts, and thus give the spectacle of music some sort of concrete meaning. Instrumental music lacked the same depth – how could it decisively mean in the absence of language? What it was good for, however, was play and pleasantry. A symphony made for great background music while the prince schmoozed with the count’s daughter. Instrumental music was pretty, pleasant, and sociable. The Romantics flipped the story. Over a very brief period of time, the “meaningless” realm of instrumental music, what was labeled in typical Germanic bombast as “Absolute Music,” came to wrestle the philosophical high ground from vocal music. Ineffable, sublime (i.e. vast, terrifying), and infinite, instrumental music (particularly the symphony) was not just merry background music for a party; it was the Truth. Schopenhauer likened music to an embodiment of the universal Will, transcending mere language, code, and representation to strike at the actual thing in itself. The symphony – particularly Beethoven’s – was, in RT’s words, “great” and not simply pleasant; treating it as anything else would be a sort of sacrilege, a subversion of the rightful hierarchy of aesthetic values. And what was left for vocal music after the revolution? It was certainly a lot harder for voices, with all those pesky, literal words that they like to produce, to reach the same level of sublimity as the symphony. Vocal music was denotative, with specific texts and specific semantic meanings; symphonic music, on the other hand, was connotative, abstract, deeply subjective, the perfect accompaniment to the era’s burgeoning lionization of the lone, autonomous individual. Rarely in music history do aesthetic shifts take place so abruptly, and so violently. This account, of course, is a simplification; as RT is quick to admit, plenty of contradictory aesthetic cross-currents coexisted with the Romantics. Yet, what happened here was indeed profound; we’re still reeling from it, in fact. Rather than the gradual, processive change that usually informs the historical movement of the arts, this one was more of a reversal, a flip. It’s a little like a canoe; you can put pressure on it and it will rock back and forth, but it still stays afloat. Then, when the tipping point is reached, it ceases to rock; suddenly, it flips and you’re in the water. A crude metaphor, perhaps, but oddly apropos. For the next two + volumes of the book, we’ll be swimming in these deep waters. Musical representation is a woolly topic. We all know that music can move us, both emotionally and physically; it can also stimulate our intellects. But how are specific images encoded, sans words, in the language of sound? How can music imitate physical movement, abstract concepts, places? On the level of bodily experience, certain sounds translate into certain images on account of the metaphoric systems we unconsciously use to make sense of them. For instance, when soundwaves gets narrower, we perceive that the pitch is going “up”; when the waves get wider, we hear them as going “down.” These designations, of course, are culturally and historically based (and may have a lot to do with notation) – not everyone maps sounds onto vertical space (up/down). For example, the Suyá of Brazil conceptualize pitches in terms of the metaphors of “young” (high) and “old” (low); others around the world think of pitch as “light” and “heavy,” etc. In the West, the metaphor of up/down is so reified in our musical thinking that it can be put to service in the construction of musical representations. * Moving “up” in range, then, can be equated to a host of experiences and concepts, such as spiritual transcendence. Similarly, “madrigalisms” work on the level of bodily experience by imitating emotional and physical sensations. For instance, the word “trembling” might be set to a trill, which sonically conjures the act of physically trembling; weeping (“piangendo,” a common madrigal trope) would find its analog in vocal gestures that mimic the sighing, deflated spasms of crying. Sound-body mapping is central to the musical embodiment of these physical states. But when you get beyond bodily experience, musical representation becomes a bit trickier. If music is “organized sound,” then how does one go about representing chaos, the very opposite of order and organization? A host of composers have tackled this question over the years and, unsurprisingly, the translations vary widely according to aesthetic sensibility and time. Haydn’s Creation features a particularly well-known instantiation of musical chaos: it begins with a forceful unison, then gradually the threads wind their way through different key areas, often chromatically, in search of a home key and the stability of tonal procedures. As Tovey observed, “tonality is Haydn’s musical Cosmos” (II, 634). Indeed, this opening passage still packs a wildly expressive punch. The defiance of tonal expectations and subversion of the “natural” magnetism of leading tones provides Haydn with a potent musical strategy for representing chaos. As a counterpoint to Haydn’s point, I’ll close with a very different musical portrayal of elementary formlessness. Wayne Shorter’s “Chaos,” from his underrated 1965 album The All Seeing Eye, uses jagged, dissonant phrases and – fittingly enough – free improvisation to reference inchoate cosmological states. Shorter’s chaos does not implicate tonality per se, but rather goes against the regular, periodic harmonic structures of traditional jazz. Both Haydn and Shorter, then, sought a portrait of disorder in the subversion of the musical systems that served as the syntactical baseline for their respective styles. And yet our system of analysis is built around the activity of noticing similarities—not deviations—in different works. What would an alternative procedure of analysis look like? Upon hearing the second movement of Haydn’s “Military” Symphony (No. 100), one critic wrote of the “hellish roar of war increasing to a climax of horrid sublimity!” It is difficult to fathom that this polite, classical symphony could be considered “hellish” and “horrid” sounding, conditioned as we jaded moderns are to music of a far more hellish affective character. Once you’ve heard Beethoven’s 9th, Götterdämmerung, The Rite of Spring, and 95% of new music since 1920 – not to mention the popular music spawn of hell, death metal – it is hard not to hear Haydn’s symphony as tame, even bordering on quaint. Have our ears changed that much in the intervening 200+ years since the Military Symphony debuted to rollicking success? In this regard, it has. The musical representation of fear, war, terror, and the enemy – what our 18th century reviewer called “horrid sublimity” – has morphed considerably from the contained Enlightenment aesthetic to today’s (post-)modern ethos, influenced as it is by expressionism, psychological realism, and Artaudian cruelty. Listening to Haydn’s symphony vividly demonstrates the historical variability of musical signs. The first movement of the Military Symphony features a light, galloping rhythmic pattern (long-short-short) that is all energy, momentum, and drive. Affectively, the opening still carries strong connotations of a rousing adventure; it brings to mind “William Tell” and the “action music” sequences of the silent film era, conjuring images of square-jawed, bright-eyed men racing into the horizon on trusted steeds. There is a martial quality here as well, though not as blatant as in the next movement, which gives Symphony No. 100 its “Military” appellation. As the allegretto opens, we get a sense that Haydn has eased back on the accelerator; while the first movement is full of motion and charge, this one begins with a moderately slow tempo and a dainty melody set to a dance-like rhythm. The theme is perfectly symmetrical, the very model of classical balance, and it conforms exactly to expectations; cadences are in the right places and harmonies move from one to the other in an orderly, predictable procession. Haydn is well known for his musical humor and his love of rhythmic tricks (think the “Surprise” Symphony, for instance), but there’s nothing at all unexpected about this opening. It is a portrait of musical civility and grace. And then come the Turks. At 1:43, the C major of the placid opening is suddenly twisted into minor and the full ensemble enters forte with the opening material in the minor mode. There’s a Jekyll and Hyde element to this abrupt shift; it comes completely out of the blue, and with only one bar preparation (a descending minor triad in the low instruments), we go from the happy, stable ground of the opening to the invasion of the Ottoman army. Haydn draws upon an orchestrational novelty – an expanded battery of percussion instruments – to connote the Musselman hoards, particularly cymbals and triangle. It’s a wrenching transition, even to modern ears, although it must have been much more dramatic (and titillatingly terrifying) to the audiences of the late 18th century. The centerpiece of the movement, and indeed the whole symphony, is a gesture of musical orientalism, a portrait of the Other that is riddled with the semiotic codes of Turquerie (and let us not forget that Mozart dabbled in these codes as well). At 2:54, we’re back to the orderly, civilized opening theme in the major key, as if nothing had happened at all (or, if Dorothy was listening, “it was all just a dream!”). At 3:30, the percussion enters again, but the theme stays in the major mode. And at 4:43, another signifier of the military enters into the evolving musical narrative in a form of a (positively Mahlerian) solo bugle call. It seems the armies of Europe, and thus civilization, are on the march! At 4:55, the bugle cuts out and we hear a timpani roll crescendoing into a fortissimo Ab major (C in the bass), with full percussion support. This din is the “climax of horrid sublimity” referred to by the reviewer. Sabers rattle around us as we clash with the enemy in battle. Haydn represents the enemy in this movement by means of musical exoticism. By dipping into the semiological pool of Turkish signifiers, he is able to tap into late 18th century anxieties about invaders from the south. The threat is presented, then promptly neutralized; we end the movement with full percussion, but all the fight has been drained from it, and it seems only to reinforce the opening materials, which serve as a musical representation of civility. There are two points during this movement that register the highest level of terror: when the Turkish percussion first enters and the melody suddenly lurches into the minor mode; and towards the end, when blaring tutti in a new key and rolling timpani (which was then considered a novel technique) conspire to make a warlike noise. In both instances, the threat quickly subsides. The enemy is safely contained. Here, in a nutshell, is the Enlightenment aesthetic of distance. A handful of years later, Kant published his Critique of Judgment, with its notion of “disinterested interest,” a classic formulation of this aesthetic principle. Terror and other extreme states were meant to be observed from a comfortable distance, not actually experienced. Both classical and modern representations of musical terror deal in the sublime, not in today’s sense of the word as “beauty,” but in the classical, Enlightenment understanding of the term – as overwhelming “awe.” Yet the sublime is a moving target historically. What was “horrid sublimity” to Haydn and his contemporaries is practically cute today. The horror of warfare remains today what it was millennia ago; brutal, nauseating, and dumb. The way we represent these eternal conditions through music and the way we listen to sublime terror, however, have shifted profoundly since the 18th century. Terror itself is a universal; we just deal with it in different ways at different times. In Haydn’s day, the roaring lion would have been shot, taxidermized, and displayed for the public to gawk at; today, many people spend good money to view lions in person on safari. The lion is the same – the distance has changed. H.C. Robbins Landon, Haydn: Chronicle and Works, Volume III (Bloomington: Indiana University Press, 1976-1980), 247. James Webster, “Haydn,” In New Grove Online, ed. Deane Root (Oxford: Oxford University Press, 2007-2010). Mozart, quoted in Richard Taruskin, “Resisting the Ninth,” 19th-Century Music 12/3 (Spring 1989), 249.